I am delighted to share with you that we got a week off due to the Eid Al Adha celebrations. One of the rare perks of being in the UAE. Unlike last year that we braved to experience Kashmir, we opted to discover more of UAE and savour the basics (one of which is to invest on sleep). Yesterday was very random, after the periodic dental visit and having done some necessary readings, we ordered from Max’s Restaurant pancit luglug and their sarap to the bones classic chicken. Guess what happened next? We decided to go for picnic right there and then. We went to the Heritage Park as the sun was setting in along with our cats. It has been on the list for a long time, but it always gets deferred. Heritage Park is quite momentous to us because it was the first ever park we visited in UAE, particularly in Abu Dhabi. I can’t believe we have been here for over 5 years already. 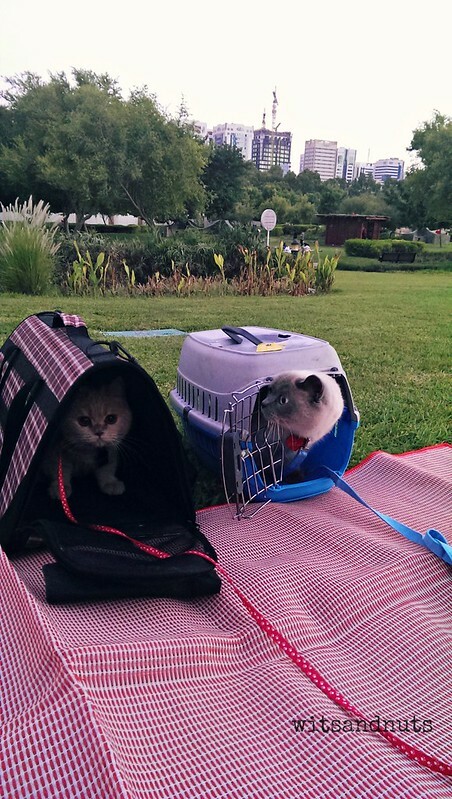 We have always wanted to take Winello and Perdita to a park for a long time. But we were hesitant to test the water since it is uncommon/ not exactly encouraged to have dog and cat pets in the UAE for several reasons. But gladly perceptions have changed in consideration of the expats lifestyle. We respect the give and take concept, hence, we deliberately went to the spot which we thought will not draw much attention for the cats. Not too long, we were relieved to see other families with their pets. 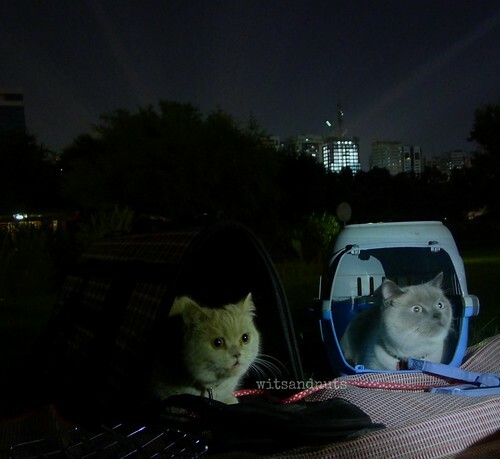 We were confident though that Winello and Perdita would behave nicely since it is their first time to be outdoor that long and with that kind of open space (not their normal trips to the vet). Much trust on their level of risk appetite to be in trouble. As expected, their “exploration” was reasonably limited to killing their curiosity about the scents of the plants and whatever kind of sound may appeal to them. They moved here and there and back to the picnic mat or cage. (Tip: It is preferable to carry pets in a bag cage instead of the classic cage because it is more comfortable and it gives a discreet/ fashionable look. It has breathing holes, too.) The leash was really unnecessary as they were so responsible (or maybe still cautious of the outside world?). It merits them another adventure to another park soon. I guess Winello and Perdita will agree with us that the best part of yesterday’s picnic (not even the munching part while listening to/ watching The Corrs 1998 concert video) was being able to lie comfortably on the mat and dreamily stare at the moon, stars and the occasional sighting of airplanes like they were going to bump at the moon. I guess this weekend will be memorable for you in a good way. Your kids will enjoy the interaction with the kitty (and might be a little cautious at the start which is normal). my they have grown!! and look how gorgeous they are!! Like you we also stayed home and enjoyed endless trip to the beach. Oh it was awesome to have it on our own without much tourists. We gathered fresh clams for yummy soup but with the recent ordinance, I guess that’s the first and the last of it.